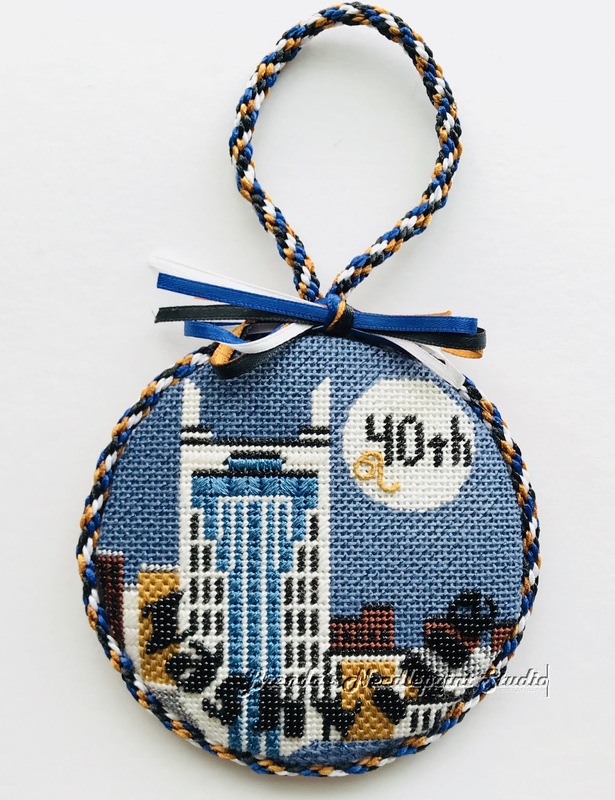 July 29, 2018--The ornament was presented last Thursday to the birthday girl while celebrating in Nashville, TN. I was fearful she wouldn't recognize the building, so before giving the ornament to her, I brought Nashville's skyline to her attention, pointing out how the building was referred to as the "Batman" building by the locals. Problem solved. I hope she enjoys it for years to come as a memento of the wonderful time we all had. Below is a picture of the building in question. I think it was well represented by the artist. April 10, 2018--Finished this Nashville 4" ornament commemorating my husband's niece's 40th birthday being celebrated in Nashville. The cording is made out of 8 strands of 1/8" satin ribbon in 4 different colors: white, gold, blue and black, on a kumihimo braiding round. The embroidery on the back of the ornament was stitched on my Bernina 1530 sewing machine (an oldie, but a powerhouse goodie). The gold backing fabric comes from a drapery sample book given to me by my sister. She used to fabricate draperies and bedspreads and when she retired, she gave me all of her old sample books, and they are the perfect size for ornaments. Then the whole shebang is glued together. I don't place glue directly under the stitching nor under the backing fabric that you see, but the parts that wrap around the mounting board and padding are glued down. The cording is also glued in place--all faster than stitching. I hope my husband's niece likes it. 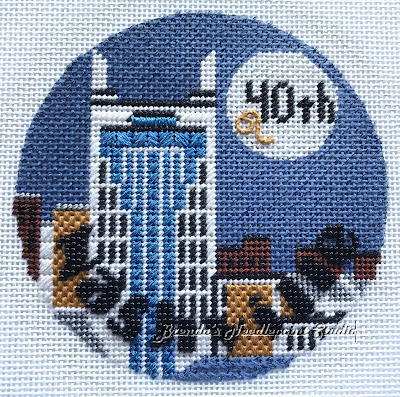 February 21, 2018--The ornament to celebrate my husband's niece's 40th birthday in Nashville is done. The little gold design in the moon is the zodiac symbol for the Lion. I like how it came out. I have time between now and July to finish it into an ornament with cording and some ribbons (not too many--am not into fru-fru). February 15, 2018--My husband's niece is turning 40 in July and she invited her world to celebrate with her in Nashville, TN. We've been there once, but it was a quick in and out type of thing, so we responded Yes! So, what do you get a beautiful woman (and one of the nicest ones too) with a handsome husband, two gorgeous children, a home on a lake, etc.? Needlepoint! 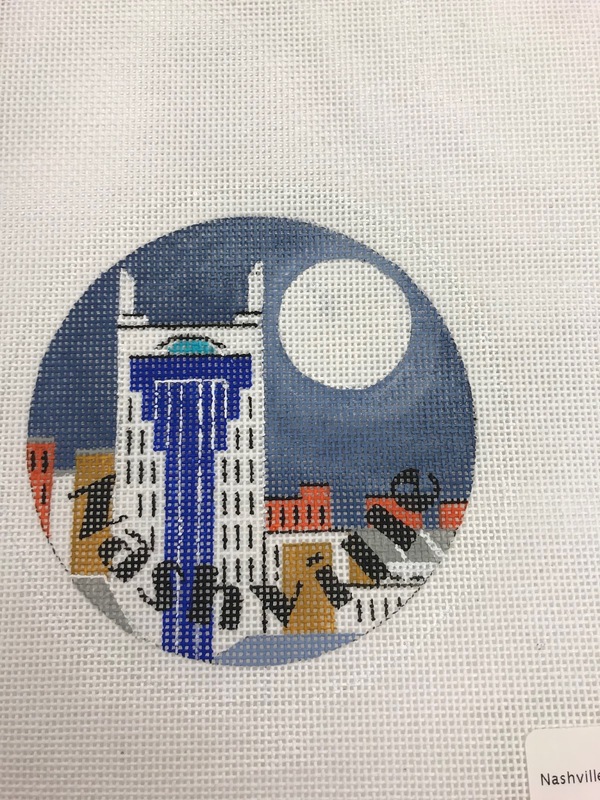 I'm sure no one else in her life does needlepoint, also I'm quite confident that no one in her family reads my blog, so this will be a surprise. 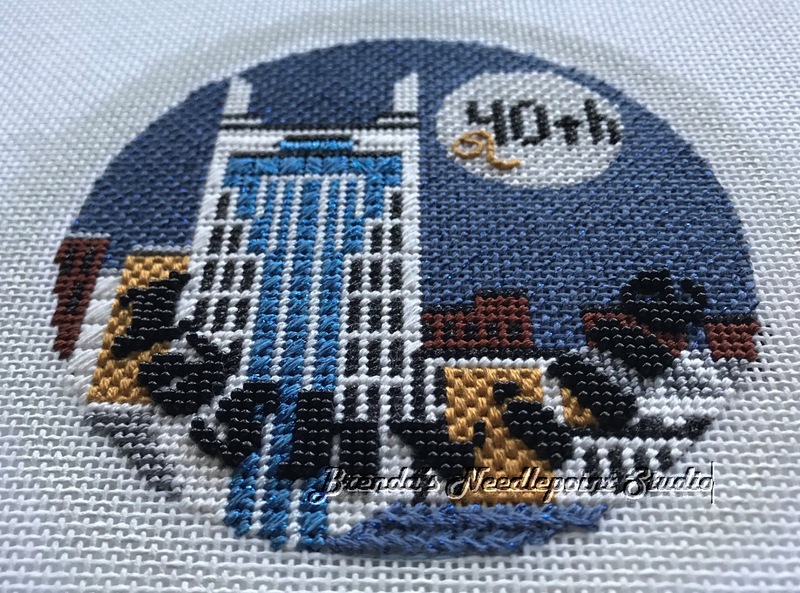 After inquiring of the wonderful readers on Facebook's Needlepoint Nation as to where I might find a Nashville theme related ornament, I received some nice responses and found one I could order and receive immediately (needing all the time in the world to get this done). It also had a stitch guide and threads. Glad it came as a kit--I only had two of the many threads used in this piece. 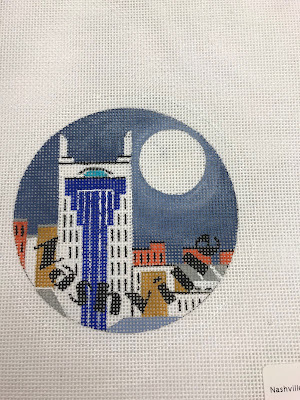 Below is the canvas designed by Tina Timberlake exclusively for Nashville Needleworks. There's a lovely white space inside the full moon where I'll stitch in the birthday gal's name, the date or just "40". Not sure yet. 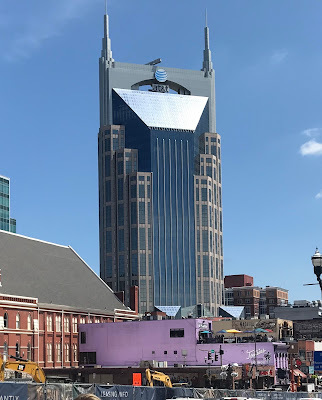 This is called the "batman building" ornament and I had to google what that meant. 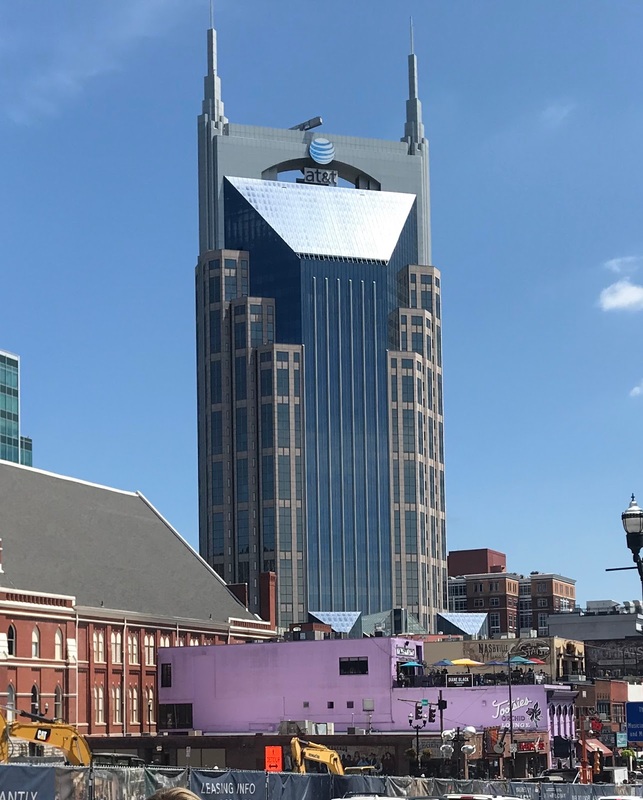 After seeing photos of Nashville's skyline, now I understand why. 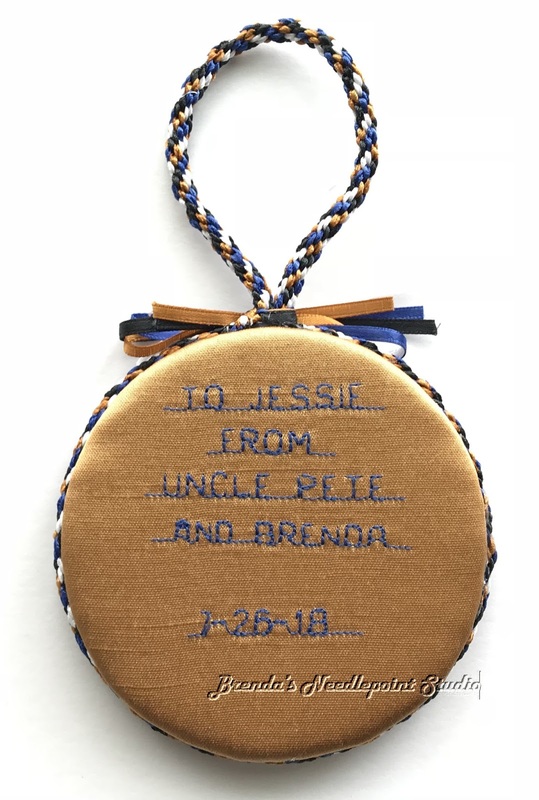 Love your stitching and finish! I am thinking I might try one of these ornaments for my daughter who celebrated her 30th birthday in 2017.